What do you get when you combine the white-knuckle action of dirt flat-track racing, with the heart-stopping jumps and obstacles of motocross, the thrills of paved road racing and live concerts? AMA Supermoto at the Sturgis Buffalo Chip, that’s what! And this August you and your friends can come face to face with this insane race hybrid at The Best Party Anywhere®! On Friday, Aug. 12 and Saturday, Aug. 13 the country’s fiercest road racers, dirt trackers and moto crossers will be tearing around a one-of-a-kind Supermoto track that cuts through both the Sturgis Buffalo Chip’s amphitheater and the streets in the surrounding campground. This means you can get in on all the excitement whether you’re hanging out in the Top Shelf, throwing back a cold one on the Pabst Blue Ribbon Roadhouse Deck or kicking it at your own campsite! 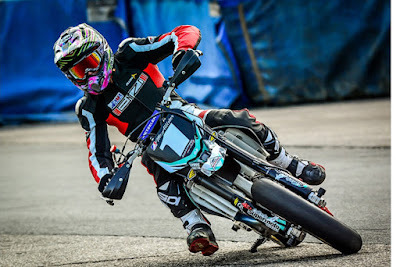 The sport of Supermoto grew from the late ‘70s made-for-TV event “Superbikers” on ABC’s “Wild World of Sports.” Since then, this cross-discipline event has gained massive popularity, eventually becoming a nationwide series sanctioned by the American Motorcyclist Association. While tracks can be found at venues across the US, seeing these highly competitive racers jump, slide and speed their way through the Largest Music Festival in Motorcycling® in Sturgis, SD will be unlike any other race in the series. Be there or miss out three of the most exciting types of racing all rolled into one unbelieveable event. Find out more about AMA Supermoto at supermotousa.com. Why: Experience the most exciting elements of three distinct types of racing! How: Reserve your passes online now!